Are you ready for a craic-ing good time? Fancy sliding over that rainbow of luck and into that pot of gold? Well, the newest mobile game by Mr Spin is the slot for you! May the luck of the Irish be with you as you play Emerald Rainbow Wins! Featuring 20 locked win lines, a super exciting scratch card multiplier mini-game, and hosted by a money-mad lucky leprechaun, this really is the slot of your emerald green dreams! With an ace-tastic free spins mode and a progressive Mega Jackpot bigger than the Giant’s Causeway, you’ll be wanting to know exactly how to play the wondrous slot. Keep on reading to find out everything you need to know! You can play Emerald Rainbow Wins and any of our other fantastic slots games by using a device running iOS 10 or higher or on Android 5.0 and above. Got your four-leaf clovers at the ready? It’s time to get started! The first cel-tick in the box you need is to choose your bet-per-line. Because Emerald Rainbow Wins has a set 20 win lines, your bet-per-line will always be multiplied by 20 in order to give you your ‘Total Bet’ amount, visible in the bottom left. You can adjust your bet-per-line amount using the ‘Bet’ menu, and by tapping the ‘+’ and ‘-‘ buttons. For example, should you wish to bet 10p per line, your total bet will be 10p x20, which equals £2 – simple! You can bet anything from 1p a line up to £10, so you’ve got plenty of room to find your sweet spot for your total bet. Our lucky leprechaun knows just how to treat his guests! So he’s happy to do all the work for you with the Auto Spins feature. All you have to do is tap ‘Auto Spins’ in the ‘Bet’ menu and you’ll be able to set your auto spins, max win and minimum credit limits. Once you’re happy you can get the reels started by tapping the spin button. The reels will start to spin and will stop only once you’ve reached one of your set limits, or you decide to manually end Auto Spin with the ‘Stop’ button. Fingers crossed for some Emerald Rainbow Wins! There’s no prettier sight than a rainbow – nothing other than a big win that is! That’s why Emerald Rainbow Wins makes sure to light up all any winning combinations that spin in so you know when to get excited! Every type of win will award you a multiplier of your bet-per-line as a prize – other than that huge progressive Mega Jackpot! Like a trip from Galway to Dublin, all win lines pay from left to right. But don’t be disheartened, because you can win across multiple win lines at once! Depending on how lucky you are, you could land up to 20 separate wins on the same spin! We’ll be sure to count only the biggest win per line and total them up on screen to show you your huge win! If you’re lucky enough to land a big win, your eyes will be dazzled as the screen fills up with rainbow colours and counts up your golden prize before it is automatically added to your credit. You can find out exactly what symbols can combine to give you a win by looking the paytable found in the top left-hand menu. Everyone knows there’s a pot of gold waiting at the end of every rainbow and the golden coins of the Wild symbol are there to help you find it! The Wild symbol can substitute for almost any symbol in the game to help you reach a Cork-ing win! For example, you might have spun in two golden As in a row and are hoping for a third. But if you see a Wild symbol spin in instead you won’t be disappointed! That Wild will substitute in and earn you a win worth 3x golden As! Wilds can also act as more than one symbol at once, helping you to win on multiple win lines simultaneously. That’s some serious leprechaun magic! Wilds can’t help you to enter the mini-game or win the progressive Mega Jackpot though. You’ll need all 5 Jackpot symbols on an active win line for that to happen! If you see three or more of the lucky leprechaun symbols spin in anywhere on the reels, they’ll start chuckling away, and so will you! That’s because they’ll trigger Emerald Rainbow Wins’ scratchcard mini-game, Pick O’ Card. The more laughing leprechauns you see on the reels, the higher your potential prize will be! You’ll be presented with a selection of scratchcards to choose from. The lower the potential prize the cards have, the greater chance you have of winning, and vice versa. It all depends on how lucky you’re feeling! Make your selection and scratch away the squares to reveal if you’ve won or not! If you’ve been lucky enough to get 5 leprechauns on the reels, you’ll have a shot at the x10000 ultimate prize – will you take the risk? There’s no more beautiful sight in all of Ireland than a rainbow arcing through the sky! That’s why our Free Spins symbol is a rainbow, and it might just lead you to some massive wins! Spin in 3, 4 or 5 Free Spins symbols onto the reels and you’ll be awarded 7, 14 or 21 free spins respectively. That’s right – you could bag 21 free chances to win in one go! Once you’ve triggered Free Spins Mode you’ll see blue skies and hopefully some big wins! The reels will change to focus only on the three tiers of A symbols, upping your chances of winning some dosh. How much will you win? If you’re new to Mr Spin then you’ll be wanting to take advantage of our incredible welcome offer! Register your one and only account with us today and you’ll receive up to 50 free spins* with no deposit required! When you make your first deposit, you’ll also receive 100% first deposit match up to £100! 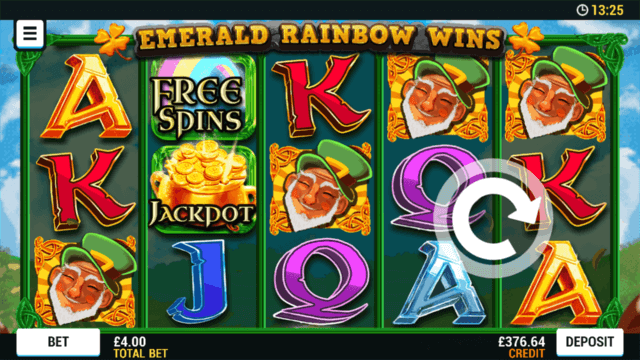 * Join and play Emerald Rainbow Wins today! Emerald Rainbow Wins has a theoretical return to player (RTP) of 94.4%. This is based on long term playback. System malfunctions void all payments. Monies are staked in the following order: winnings, player deposits, bonus credit.